Bob Regan, a Grammy- and Dove Award-nominated songwriter and past president of the Nashville Songwriters Association International, created Operation Song in 2012. To find out more about Operation Song, to hear the music created by its participants or to support its programming via a donation, visit www.operation song.org or www.Facebook.com/operationsong chatt. Some stories are easier to tell than others. Some — the especially painful ones — never slither into the light of day at all, but skulk along as unspoken traumas that harry the mind and weary the soul. In the field, a soldier carries heavy loads on all sorts of terrain, but the greatest burdens are the tar-black memories that cling to them in secrecy long after they've taken off their uniforms. Helping veterans coax out and face down these terrible tales and, in the process, transform them into music, is what Nashville composer Don Goodman is trying to do. "It's the weirdest thing, man, when we start playing that guitar, they just start talking," the 72-year-old Goodman says of his work with Operation Song, an alternative therapy program that predominantly treats veterans, active military personnel and the families of soldiers, all of whom are suffering from post-traumatic stress. "All the sudden, they're working on a song, and they don't think about the fact that they're saying things they haven't told anyone else anymore," Goodman says. "I've had guys who say, when we're done writing, 'You know, you're the only person on Earth who knows that.'" "When Terror Came to Chattanooga," written by Navy Lt. Cmdr. Tim White, with Don Goodman and Steve Dean. White returned fire when Mohammad Youssef Abdulazeez attacked the U.S. Naval and Marine Reserve Center on July 16, 2015. Operation Song meets Wednesday mornings in a conference room on loan from Erlanger hospital on the third floor of the Chattanooga Lifestyle Center overlooking Market Street. Veterans and families of veterans from every conflict since World War II gather at a long wooden table to share their memories and try, with the help of Goodman and fellow songwriter Steve Dean, to find the music in the misery. Each week, participants take turns airing and unburdening themselves of nightmarish memories: Family and friends lost in combat, bad commands with fatal consequence and lives ended too soon, whether by others or by their own hand. Many say they feel so haunted by these experiences they suffer from insomnia and nightmares, irrational anger or emotional withdrawal. At the foot of the table, the program's coordinator, Bobbie Allison-Standefer, sits at a laptop, transcribing the stories that veterans drag out of themselves. Behind her, where everyone can see, their words are projected onto a white screen. As participants speak and Standefer types, Goodman and Dean — who have unofficially been dubbed "Shakespeare" and "Beethoven," respectively — listen and try to find lyrics and melodies buried in memories that emerge from each veteran in a torrent of words that can fill a dozen typed pages or more. Participants in Operation Song's eight- to 10-week course say converting bitter experiences into songs is an intensely cathartic, if occasionally painful, experience. Most importantly, they say, it helps them bring order to a confused snarl of pent-up anger, depression, guilt and regret. Samuel Dean — no relation to Steve Dean — served in the Marines for 21 years, including numerous Middle Eastern tours in Iraq, Afghanistan and Bahrain. Halfway through the Operation Song course, its writers have helped him complete a rough draft of his composition, "On the Shoulders of Giants," a song honoring his squad mates and contrasting his father's and grandfather's experiences serving in the Vietnam War and World War II. "I've been to a lot of therapy sessions for what, two years?" he asks, turning to look at his wife, Jennifer, during a session earlier this month. Suddenly overwhelmed, the heavily muscled and bearded 41-year-old briefly tears up, but he continues speaking after a pause and a shaky breath. "This gives [speaking] a purpose," he says while his wife grips his arm reassuringly. "I'm not just talking to make myself feel better. I'm talking because I'm going to have something; my children will have it. It will always be recorded. It's there forever." "It's awesome," he concludes. "You hear other people's stories, and you listen, and you know the pain." "The Last Monday in May," written by Bob Regan and Don Goodman at the Alvin C. York Veterans Affairs hospital in Murfreesboro, Tenn., with six veterans from four wars. Operation Song draws in some veterans who say they found comfort in the music they've heard created by past participants. Others are sent the program's way via the U.S. Department of Veterans Affairs. In addition to serving active military personnel and veterans, Operation Song has worked in the last 10 months with family members of the five Chattanooga servicemen killed in the terrorist shooting on July 16, 2015. In one session, Cathy Wells, the mother of Marine Lance Cpl. Squire "Skip" Wells, sits to Sam Dean's left. In June, she wrote the song "Tennessee Blood" in honor of her son, who appears in military dress on a button she wears on her shirt. Despite having met for the first time three weeks earlier, she and Dean say they draw strength from one another. "Since I've been sitting here with [Dean] for the last couple of weeks, I've been paying more attention to my thoughts," she says. "I haven't gotten to the point where I'm writing them down yet, but I'm remembering the thoughts and am like, 'I need to write this down.'" The veterans who have enrolled in an Operation Song class say they also draw comfort from the commonality they feel sitting at the long table. Even after their songs are finished, many participants don't want to quit coming and instead take advantage of the program's open-door policy, returning each week as "alumni." If they continue to write, which is encouraged, Goodman and Steve Dean take the time to work with them on those songs as well. "I'm going to keep coming back," Wells says, elbowing Dean on her right. "As long as he's here, I'll keep coming back." "Tennessee Blood," written by Cathy Wells, the mother of Marine Lance Cpl. Squire "Skip" Wells, with Don Goodman and Steve Dean. Wells was one of five servicemen killed in the terrorist shootings on July 16, 2015. Operation Song was founded in 2012 by Bob Regan, a Grammy- and Dove Award-nominated songwriter and past president of the Nashville Songwriters Association International. A lean, white-haired 67-year-old, Regan's songwriting catalog includes several Billboard Country Top 10s, including "Thinkin' About You" by Trisha Yearwood, "Busy Man" by Billy Ray Cyrus and "Your Everything" by Keith Urban. During a series of tours with Armed Forces Entertainment in the 2000s, Regan performed for U.S. troops in Western Europe, the Balkans, the Middle East and Africa. A civilian with no military background, he says those trips opened his eyes to the "depth and breadth of the people serving" and planted the seeds of an idea to help them turn their experiences in the Armed Forces into music. "I met gray-haired grandmothers from Tupelo on their second deployment in Iraq. It just kind of blew my mind," Regan says. "Being a songwriter — and songwriters being armchair therapists — I thought, 'How cool would it be to sit down and write songs with these people and tell their stories?'" In 2012, Regan decided to put his idea to the test. In collaboration with a music therapist, he started writing songs with soldiers at the Alvin C. York Campus of the Veterans Affairs Tennessee Valley Healthcare System in Murfreesboro, Tenn. Based on the success of that program, Operation Song expanded in 2013 to Fort Campbell in Clarksville, Tenn., to Chattanooga in 2014, and to the Veterans Affairs Medical Center in Nashville in 2015. The program also runs a women-only songwriting program at the VA center in Nashville exclusively for victims of sexual assault. In all, Regan says, the program has produced 350 to 400 songs based on the memories of more than 300 veterans. "We try to make sure our program is being constantly vetted by people in the military and therapists in the military community to make sure we're on track and actually being of benefit. It seems to be unanimous that we are," he says. "We've written with everyone from people whose trauma is 60 years old at this point to people whose trauma is not even a year old." "Standing on the Shoulders of Giants," written by Sam Dean, a 21-year Marine veteran, with Steve Dean and Don Goodman. The song was inspired by Dean's service and that of his father and grandfather in the Vietnam War and World War II. Once Operation Song's participants in Chattanooga are happy with Goodman's and Steve Dean's work, their songs are produced at various facilities in Nashville that have donated the use of their equipment and personnel. One studio, Goodman says, is owned by an ex-Marine, and its sound engineer's father died of alcoholism resulting from undiagnosed post-traumatic stress disorder. "Everyone who donates has a story in their family," Goodman says. The songs created by the program have been broadcast locally on WUTC-FM/88.1 and globally via American Forces Network, the military's official radio and TV network. Others have been uploaded to Operation Song's website or have appeared on compilation CDs that can be purchased through a donation to the program, which is a nonprofit. Participants' music also has made its way into several recent live concerts in Chattanooga, including a featured performance during the Pops on the River celebration on July 3; the songs also were featured Friday as the opening act of the Nightfall concert series. On May 28, country singer William Michael Morgan received a standing ovation at the Grand Ole Opry in Nashville for his performance of "Last Monday in May," an unofficial Memorial Day anthem written by Operation Song participants. Two days later, "The Forgotten War" by Korean War veteran and Operation Song participant Carl Murphy, was performed at the Korean War Memorial in Washington, D.C. If a participant prefers to remain anonymous, their wish is honored, but organizers say ensuring these songs are heard by a wide audience is an important part of Operation Song's mission. "I tell these guys when they come, 'I don't want to just write these songs and leave them here on the table or give you a tape to go home and have that be the end of it,'" Goodman says. "I want to do everything we can possibly do to get these songs played for people to hear them. "When the whole world knows your story, you don't have anything to hide." "Chattanooga Rain," written by Lorri Wyatt, the widow of Marine Staff Sgt. David Wyatt, with Don Goodman and Steve Dean. Wyatt was one of five servicemen killed in the terrorist shootings on July 16, 2015. Between them, Goodman and Steve Dean have spent a combined 80 years writing songs in Nashville. Their credits include tracks recorded by Loretta Lynn, George Jones, Alabama, Ike & Tina Turner, Reba McEntire and Waylon Jennings, among others. They rely on their experience as Goodman combs through the veterans' words, picking out especially moving lines or turns of phrase to tease into lyrics, which Dean — who is 62 — then sets to melodies that he composes on the fly. Goodman's and Dean's long-running careers are a necessary component of Operation Song. "They need to be older and experienced to be able to do this," Standefer says. "We don't want any young songwriters because they just haven't had the experience yet to handle the situation or the experience to be able to take those stories and make a wonderful song out of it." Like the veterans they're helping, Goodman and Dean say contributing to Operation Song can be far more fulfilling than their day-to-day work on Nashville's Music Row. "These songs are true. Everything in them is true," Dean says. "Many times, when you're writing commercial songs, someone has an idea and you just make up something. Nothing is as real as what the veterans have seen and gone through, what they want to put out onto paper." Despite many previous collaborations with high-profile artists, Goodman says Operation Song has truly defined his career since he started assisting with the program in 2012. "Honest to God, I feel like the first 42 years in Nashville were practice," he says. "I feel like I was getting ready for this. I don't even want to write a regular song anymore. "When these guys are sitting there, telling you their innermost secrets, stuff they can't even put into words, how special is that? For a moment there, you have their hope, their life, in your hands. I pray all the way to Chattanooga, 'God, just let me be good enough.'" "A Father and A Hero," written by Tracy Smith, the father of U.S. Navy Petty Officer 2nd Class Randall Smith, Don Goodman and Steve Dean. Smith was one of five servicemen killed in the terrorist shootings on July 16, 2015. In addition to its weekly classes, Operation Song also hosts two-day songwriting retreats. 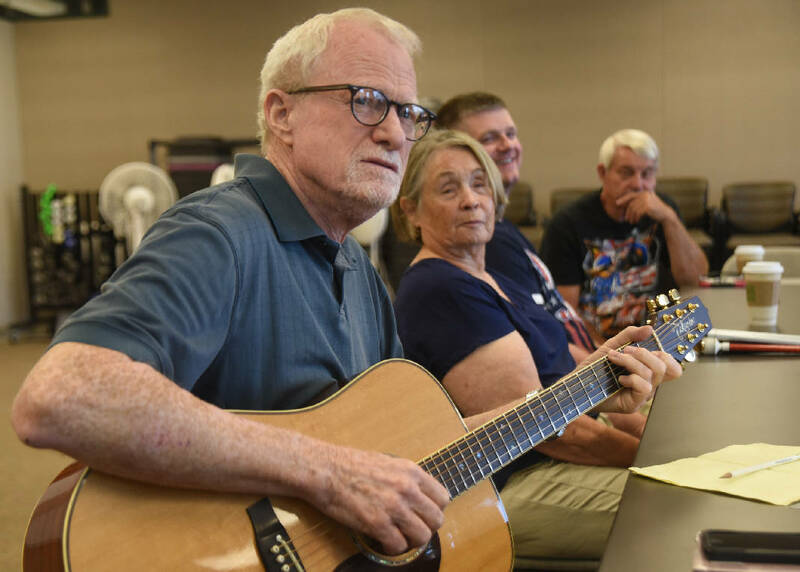 During the first day, groups of songwriters meet with participating veterans; the next day, songwriters pair off with a veteran and spend the day composing a piece that's performed that evening during a concert finale. Two years ago, U.S. Air Force veteran Lee Waters was introduced to Operation Song as a participant in a retreat at the Chattanooga Choo Choo. A soft-spoken 37-year-old veteran of the Kosovo War from Fort Oglethorpe, Ga., Waters attended the retreat on the recommendation of the VA. This year, he re-enrolled in Operation Song for the weeks-long course. Waters has attempted in the past to sort through his post-traumatic stress via traditional therapy programs at the VA. He says Operation Song is "an amazingly hard process," but he and his wife, Judy, have noticed a dramatic improvement in his well-being since he started the class. "My wife will attest that it's nice to actually see a smile on my face sometimes," he says. "[She] absolutely can see a difference, and I'm able to verbalize some things to my wife and my family that I haven't been able to before, which is huge. Learning to use this and cope with some things — it's a really big deal." Once Waters opened up and began sharing his stories, Goodman and Dean helped him compose "Thank God That You Love Me," a song addressed to his wife and expressing his gratitude for her support. Goodman is continuing to polish the song, and Waters says he's trying to avoid hearing more than snippets of it so he and his wife can experience it for the first time together. Waters initially had difficulty sharing his thoughts — "there were some very tearful days," he says — but he took comfort in the knowledge that he was surrounded by fellow veterans and in the obvious pains organizers took to do justice to the song. "They care so much," Waters says. "They want everything to be spot on because they know how much is at stake with each story. They do treat it with kid gloves. "A lot of us, we don't know how to reach in and vocalize the things that cause us angst, so learning how to do that is obviously really helpful. It's shining a flashlight on dark areas."